Our men were sick. My mother and I watched over the frog pond while our men healed. We wore men masks. The frogs, their fat was delicious and in high demand. Thieves often attempted to steal them in the night. My mother and I used night vision goggles that our men left behind, to keep watch. We waved our hands in front of the lenses, which revealed a startling contrast against the darkness: a white flame. A body near the pond, if one were to exist, would appear as a big bright interference. I moved my hand before my mother’s goggles as if it were a dancer on a stage. This amused my mother only for a short time before she returned to her post. I performed for her as the leading lady of her night-vision diorama. I recited lines from the plays I knew by heart, the lines my mother used to say when she was an actor. She is not one anymore. “You do not know what you’re saying,” she said. My mother widened her eyes and peeled her mask back against her face to stay awake. “I’m just going to rest my eyes,” I said. “You must not,” she said. “Then I will act some more,” I said. I complained of back pain and hunched over a rock. My mother snapped her fingers in front of my face. “Go take a walk. It will reinvigorate your body,” she said. Our men had all been on the stage once. Our men were very good looking and, after enough time in the mountains, strong. They had all been very loyal to my father, a renowned director who left us for a new cast. Our pond was in the mountains where our men cultivated timber and melons and raised cicadas and frogs for profit. The best restaurants in the country wanted to serve our cicadas and frogs. Once cooked, the cicadas were like nutmeat and the frog fat was rich with the most flavorful oils. Recently, we had been struck by calamitous floods. For some time, our men waded through water up to their waists to get from the timber to the melons. A black thing began to spread on their bodies, which made them sickly. Now the water was receding, leaving the landscape changed, leaving our men writhing in their beds. As I walked beyond the pond, I was drawn toward a sound, like a ball of lead dropped and picked up and dropped again, as if by a dog’s mouth. It did not cease. I crept through a patch of thick brush and branches dangling from the air like combs with long bristles toward a decrepit watch house that had been damaged by the rain. The door was made of rotted planks. Inside the house, there was an old broken bed and tattered sheets faded from rainwater, a kettle rusted open, and a decaying human body wrapped in a mantle holding a tome titled The Book of Explanations, the pages of which were flipping back and forth in the breeze. The body was covered with snails and fungi. I thought it was a sculpture, some sort of figurine, but I could still detect the body’s heat with my goggles, the bright flame of life not yet petering. I pried the tome out of the fingers that held it and sifted through it. The Book of Explanations was nothing more than an acting manual! It must have belonged to one of our men. Leaving the body behind, I tucked the tome into my satchel and returned to the pond so that my mother would not worry. I read the entire Book of Explanations in a day, in between tending to our men in their beds. It was so quiet without them well, without their chatter, their sawing, their performances at dusk in the candlelight, their doting caresses. I was most engrossed in the section that addressed experiential learning, the subsections of which were Transfiguration, Death, and What to Do with the Body in the Mantle. After reading the tome, I wanted to be an actor. When I woke, the body was gone. In its place, a thin layer of yellow dust blew away in the next wind that passed through the window. It had gotten substantially colder outside. Judging by the color of the sky, it was early morning. The clouds were stacked on top of each other like clay bricks. There was a fog over the mirror when I attempted to look into it, separating my reflection from me. Uncertain of the way back, I made my way out toward the pond. When I returned to the pond, in my mother’s place lay the dark body of a pig, its translucent ears folded over its glassy eyes, splayed on its side like a coat. The pig had been carved out hollow, its blood dried in a system of lines like a watershed map over bones. I crawled into it, heaving it over my body for warmth. I wandered to the brook nearby to look at myself. Freshwater fish swam through the current like compact crystals of light, a blurred radiance from the trappings of water. Then a peach bobbed in the place where my face should have been. I looked in the direction from which it came. A voice was coming from there. I noticed the land seemed familiar but a little bit different. I couldn’t decide what it was that had changed. I recognized the voice and followed it toward the body. It was my father. He stood upon a rock overlooking the river, a crease across his forehead in the shape of a bird in flight. He stripped down to his swim shorts; he folded his legs against his wide upper body and cannonballed into the water. He swam beautifully, with command. I walked over to the river, acting as a pig would. I sniffed at his things. My father looked at me as I looked at him: a blurred radiance in the trappings of water, a vagabond. A long arc of water streamed out of his mouth as he dove back into the river, undisturbed. I glanced into the water to see myself but could see only this: the body of a pig wavering at the surface. The sky and the water blended together in color so that I could not tell one apart from the other. A group of people appeared at the divide, darting past me but pausing at the water to put on their suits. Their swimwear was strange and bubbly, almost astronaut-like in bulkiness, to protect their skin. Then, they dove in after my father. “If our Director drowns, if our Director catches a nasty bout of pneumonia, you will all be held responsible,” a woman from shore shouted in response. My father was far ahead now. He swam expertly. I heard the rick-tick-tick mechanical murmuring of an engine. First, the arrival of a black car dragging behind it a piano on a three-wheeled platform followed by a man driving a truck loaded with melons in the back. I watched the driver slink behind the truck. Cloaked in the skin of a pig, I snuck behind the truck to catch the driver pull a sharp knife out of a case and devour a small melon. When he saw me, he shooed me away, throwing his rinds at me. Mud splattered against my coat. This was the land of my father, and this was his new cast – what replaced us. Someone eventually reached my father and dragged him back toward land. The woman remained on the shore, standing at the bank with her arms crossed over her chest, utterly unmoved. I approached her, wanting a closer look at this leading lady, the one that won my father’s heart. When I was close enough to see her face, its perfect soft symmetry, she shoved her foot in my side. I turned onto my back, stuck my legs and arms into the air and wiggled them. “Everyone’s got their knife,” I thought. My father was coaxed back to shore and given a heap of towels before he was ushered back into the black car. The rest of the cast piled into the two cars. One final man stood behind the piano, playing a tune as they moved slowly on. The day was warming up and growing brighter as the clouds cleared. My pig coat came off with some difficulty. It stuck to me as I pulled. I dug a hole in the dirt behind the bushes, folded the pig skin into the hole with its heavy head at the top, shoved it down with a thick stick, and then replaced the dirt. I wanted to follow my father. As a child, I had barely gotten to know him. His party drove on the dirt road that ran parallel to the river. A leaf flew in a horizontal line across the earth, like a finger pointing in the direction of my father. In my hand, I carried four snails, the same amount that I’d picked off the body in the watch house. Each snail, according to the Book of Explanations granted me a costume. I wanted to play the part of a leaf, and so that body was granted to me. I was one snail less as I landed at the top of the river, letting the current push me along. I was directed through a passageway sculpted meticulously by dams that led me to only one possible destination. Swept ashore where the river ended at a bank, I arrived just in time for the performance in which my father’s leading lady played the role that had once been my mother’s. She stood upstage under spotlights and scurried downstage carrying parcels and trying to hide them under sofa cushions. Her husband appeared at the doorway, upstage. When he appeared, she caressed him and asked for dresses, joining her hands in a plea. Her voice was babyish. The children whose voices could be heard remained in the wings. I too made those sounds from the wings when I was a young child actor, the stage manager whispering into my ear lines just before I said them. One of the stage managers tapped out a song on the piano. My father sat in a glass box suspended by a pulley over the audience. Each audience member clung to a piece of the frayed rope. He had the best view. At intermission, my father’s stage managers rested by the bank with their backs to the play. They looked into the water as they smoked through a pack of cigarettes. The second stage manager said, “Our director works us like dogs.” He spat into the water. My father’s leading lady eventually walked through the doorway upstage, leaving the house for good, walking into the world. The play arrived at its conclusion. My father was the most exuberant in his applause as the mass of people beneath him lowered him toward the ground. The amphitheater began to empty as the people left by lanterns. My father gathered his cast together with notes scribbled on his hands and arms. Now the wind blew horizontally across the earth, like a finger pointing at my father. I was one snail less when I decided to play the part of the wind, sweeping back and forth past my father’s face, stern with business. He pulled his jacket closer to his body. I followed my father’s caravan until we arrived at a palace, in which there was an evening party for the actors. In a pristine white dance hall with chandeliers, twelve beautiful young actresses waited for the arrival of the cast. To get closer to my father, I was one snail less when I played the role of the thirteenth beauty. He took the wrist of each young actress and danced with her in a circle around the room. My father plucked my wrist and brought me onto the dance floor. His teeth had a greenish sheen, but he was handsome with a smooth face and a head of thick and disorganized gray hair, like an underwater king. “Do you find me attractive?” he asked. I glanced and nodded. He danced with command, the way he swam, with a grace and fluidity that was unmatched in the room. Except by me, because I was his daughter though he did not have a clue. My skill intrigued him, and when the circle was over he did not part with me. It seemed to the rest of the party that this meant something, as the other actresses began to leave. We circled until the last person in the dance hall left – the leading lady – closing the door of her guestroom behind her. My father led me to a second guestroom, adjacent to the leading lady’s. He swished mint tea in his mouth. “How would you like to be cast in my next play?” he asked. “A Doll’s House,” he said. “Those are no good,” he said. “I can act a convincing death,” I said. My father took off his shirt. His entire torso was graying and black in places. I tried to stifle a gasp. My father took his barbiturates and fell asleep immediately, holding me in an inescapable grip. The next day, the leading lady asked me to tell her of my acting experience. She was cold with me but not unkind. I told her I had none, which made her friendlier with me. We crouched over the bank of the river as our Director took another swim; I dipped my toe in the water and swirled it around the orange heads of fish. I bit into a peach and juice dribbled down my exposed leg into the water. “Well, he is killing himself,” I said. I pointed to my father. My father was brought a heap of towels. In the black car, I sat by him. He patted my hand in a fatherly way. We wound around a mountain cliff again and again. My father’s leading lady sat in the front and was separated from us by a dark glass. She didn’t say a word. She performed again that night, in a mountain village, the role of Nora from A Doll’s House. My father brought me with him into the glass box suspended over the audience. Members of the audience hoisted us up once again. Inside the glass box, there was a chandelier and a table full of fruit and pork. Half the time we watched the play and half the time, I fought my father’s pull. My father’s leading lady was a phenomenal actress. She could be an entirely different person on the stage, naïve and sweet when she needed to be, bold when she needed to be. She was a wall in every other circumstance. Absolutely nobody could have access to her. I said this to my father. “The makings of a good actor,” my father said. “Don’t you ever worry about this?” I asked, pointing at the audience members holding their piece of rope that kept us high. I looked back out at the stage. Nora performed the tarantella. There was a lot on her mind (the secret that she could not share). Her husband stood to the side critiquing her performance. He criticized her moves, her posture (too tense!) and demanded why she could barely smile. “What happens to her when I take over?” I asked. “I will take care of all that,” he said. Because there was much of my father in me, I was instantly familiar with the stage and with his direction. For a while, I traveled with the cast as the understudy to the leading lady. She never once grew sick, so I remained in the wings watching her. It was like this until one night before a performance, I noticed a small slime at the bottom of my satchel that had oozed out of my last remaining snail. I slipped it into her watercress soup while she was not looking. Soon after, her face puffed up and she could not go on. That was the night of my debut. And from that night onwards, when the leading lady went on stage, the audience asked for me. It was also then when the leading lady refused to see me, or anyone. I was warmly welcomed at each palace where we stayed on the nights of our performances. At the different ballrooms where the dances were held, where the twelve beautiful hand selected actresses from the town came to meet my father – he never met my equal. I was certain he wouldn’t. He always looked for mirrors, and I was his daughter though he had no clue. There were nights when my father did not look well. I concocted pastes and slathered them across his abdomen and brought him tonics and herbal medicines. My father spent hours working on a project in an adjacent room. When it had grown quite late one night, I knocked at his door. “What are you working on?” I asked. The room had a strange earthy and wet odor. “I’m almost finished,” he said. “A severance package,” he said. My father showed me his trunk of severance packages, which was full of terrariums of all shapes and sizes that contained the rarest fish and amphibians. “I collect them as I swim,” he said. I knew that it was my time to leave, too. I felt around in my satchel, and there was one remaining snail. I was one snail less when I decided to play the part of the bird, to escape through the window for home, leaving my father on his own. I hovered over the earth until I found the pond with the two rocks beside it and the watch house nearby. I finally arrived at myself, though I had forgotten my form entirely. I re-entered my body, and when I woke, the Book of Explanations had already turned to dust. Our men seemed to have risen from the dead in my absence, as they were outside the window, rehearsing their next performance. The next time I heard my father’s voice, I was back at the river near my house. He’d aged significantly since I’d last seen him. I introduced myself to him as his daughter. I told him facts only I would know: My mother’s name was Lannie. He had loved her once. He wanted to take a closer look at me. He examined my hair, my ears, my fingers. “You acted for me,” he said. “You were good,” he said. I studied my father as he studied me. He was only a feeble shadow now, holding his body like a coat. I helped him back into it, arm by arm. 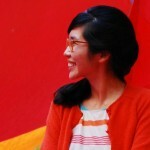 Janalyn Guo’s most recent fictions may be found or are forthcoming with Bat City Review, elimae, and Anomalous Press. She resides in Connecticut, but her collection of books is kept in a small room in Austin, Texas. Both places are home.